ABC News Watch: Pre-1910 Stevenson Screens - BOM does not know! Pre-1910 Stevenson Screens - BOM does not know! Australia has a rich history of scientific endeavour. 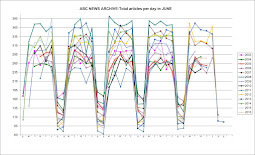 For weather observations most states had standardised Stevenson Screens installed by the 1890s yet the Bureau of Meteorology (BOM) only extend its official national temperature series back to 1910, conveniently skipping over the Federation Drought when temperatures appear to be higher than present. 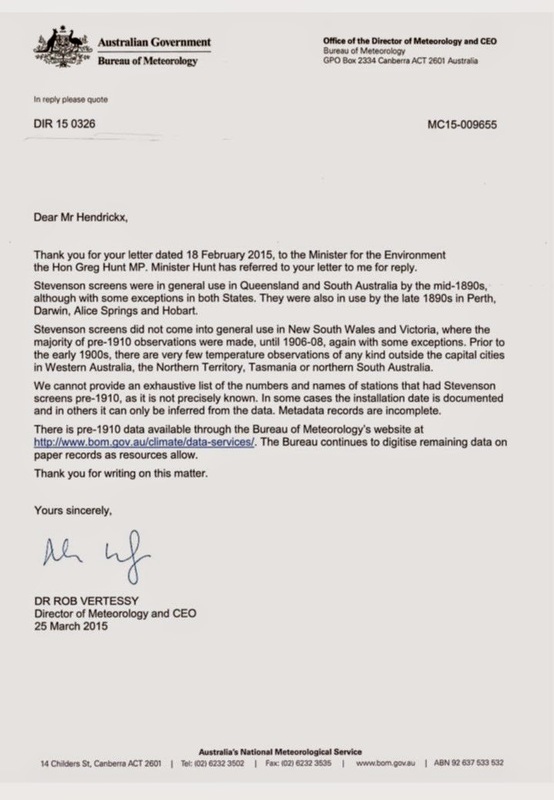 Through correspondence with the Federal Government's environment Minister Greg Hunt (see reply from the BOM below) we find that the BOM does not even know precisely how many stations were fitted with Stevenson Screens or when this occurred. Worth repeating. Our premier meteorological organisation fueled by $100's of millions of tax dollars, that is tasked with the responsibility for looking after our weather data, does not know where or when Stevenson Screens were installed, and is unable to supply this data in a digital format. The hand written ledgers probably collecting dust and disintegrating somewhere in BOM's data vault. Un - %$&##$@ - believable! (i) co‑operation with the authority administering the meteorological service of any other country (including a Territory specified under subsection 4(2)) in relation to any of the matters specified in the preceding paragraphs of this subsection. Sadly the BOM is clearly not fulfilling its functions. Sadly the government couldn't care less. The Bureau of Meteorology currently produce a series of homogenised weather products (eg ACORN). These only extend back to 1910 due apparently to the lack of standard equipment (Stevenson Screens) across the country. However a large number of weather stations had Stevenson screens installed prior to 1910. I recently enquired with the BOM about the availability of data for one such station at the former Musgrave Telegraph Station in northern Queensland (refer email attached) and was advised that records prior to 1991 have not been digitised. This station, and others along the telegraph line were equipped with Stevenson Screens and appropriate thermometers and rain gauges from 1887. It is remarkable given the controversy surrounding climate data that our Nation’s repository of weather data have not digitised and made available the complete data record for stations such as this (ie stations with standard equipment) so they can be incorporated into national climate data or made available for use by university and independent researchers. 1. How many of the nation’s weather stations had Stevenson Screens installed prior to 1910? 2. Which of the nation’s weather stations had Stevenson Screens installed prior to 1910? 3. Will the minister ensure that data from these stations is digitised and made freely available online for study? The Minister's minion at the Bureau replies. Astonishingly, when it comes to Stevenson Screens, BOM do not know where or when!